FACT 1: Live Chat shows growing popularity. According to Forrester.com Live Chat adoption among consumers has risen from 30% in 2009 to 43% in 2012. Thus adding Live Chat solution to your Company website or online store will give your users a unique chance to have their questions handled right away in real time, without keeping them waiting for email replies. In addition to this, Live Chat button added to a visible position on the website will ensure that your customers will have an ability to contact you with a mouse click. Isn’t it a convenient way of dealing with questions or issues? FACT 2: eConsultancy study reveals that receiving incentive like free shipping or additional promo coupon encourages users to Live Chat in real time with customer care reps. This way your customers will make purchases right while chatting without hesitation. By encouraging online shoppers to contact sales reps via Click to Chat tool you will ensure they get immediate service and positive customer experience while shopping. Moreover, Live Help software provides all tools for making customer experience exceptional. While pushing pages your agents will show customers only those items they are interested in making their shopping fast and pleasant. This will bring not only immediate benefits but also long-term ones, like loyalty and customer retention. FACT 3: More and more, retailers are looking for delivering seamless shopping experience to their customers. Live Chat helps to create one stop shop environment by letting sales reps lead the purchasing process from the moment a potential customer lands on the website till the moment the purchase has been made and delivery terms are discussed. Live Chat software equips businesses with variety of tools which will help to provide exceptional customer support experience. Your agents while working on Live Chat will be able to multitask and handle several users concurrently in that way reducing waiting time and improving the satisfaction rate. FACT 4: Another fact is that retailers are also looking to make sure their ecommerce site is a safe one in the eyes of the consumer. According to Aberdeen study most top companies guarantee Live Chat security to maximize benefits from Live Chat tool. Security is the one of the most important facts online consumers take into account before proceeding with shopping. With Live Chat tool security is guaranteed by secure connection which can be enabled for Live Chat sessions. Moreover, Live Chat button can be easily added to secure pages of the website without producing any security alerts in a browser. 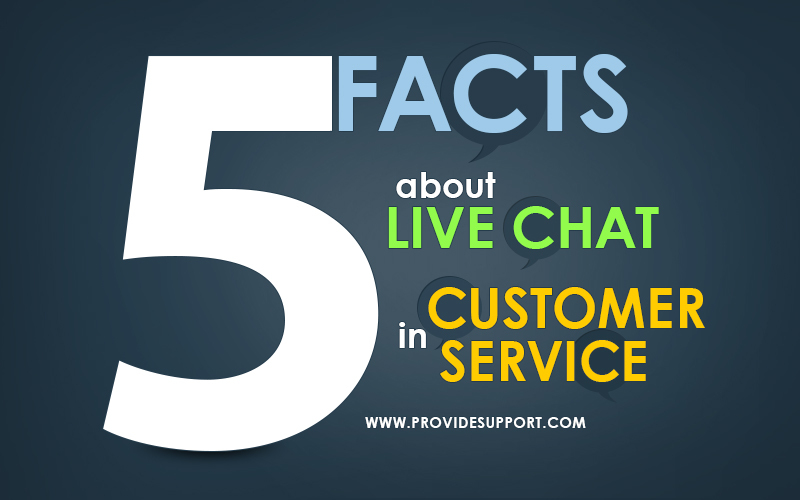 FACT 5: Live Chat considerably increases customer retention rates and improves loyalty. According to the Loyalty Marketer’s Association, customer loyalty is the key to sustainable growth. Businesses report that retaining and engaging customers remain their greatest challenges. While reinforcing your website with a Click to Chat tool you will let your customers not only contact you with a click but will also have access to plenty of valuable for marketing information like website traffic reports, Post Chat Survey results and real time monitoring. 2012 Global Customer Service Barometer research shows that three out of four consumers say they have spent more with a company because of a history of positive customer service experiences. With Live Chat tool it’s easy to deliver such experience, you can start doing this right now. Only 15 minutes of your time are required to set the Click to Chat service up and running on your website. This entry was posted in Articles and tagged customer experience study, Facts about Live Chat, live chat for retailers, Live Chat role. Bookmark the permalink.